Q) How is RO water compared to bottled water? RO Water is actually better than bottled water, many of the water companies use tap water, filter it, mix it with spring water and called it Natures Own Spring water - What a load of crock, and by using RO water, you'll save yourself quite alot of money.As for the process, we filter water to as close as pure water as you can get.Our drinking water has a sweet taste with a touch of minerals ? not like the flat taste of distilled or bottled water. The five-stage system is the most stable and complete RO process. The best part is that you maintain your system and ensure your family's health yourself. And fill as many bottles as you want for around the cost of $0.002 cents per litre. Compare an average bottle is around $3 - 7 so do the math. Q) How effective is Reverse Osmosis filtration compared to other methods ? RO is the most convenient and effective method of water filtration. It filters water by squeezing water through a semi-permeable membrane, which is rated at 0.0001 micron (equals to 0.00000004 inch!). This is the technology used to make alot of the different bottled water, it is also the only technology capable of desalinating sea water, making it into drinking water, as well as removing bacteria, chlorine, and other chemicals. Non-RO water filters are much less effective, and the pore size on these filter media are much bigger, generally 0.5 - 10 micron. They can filter out coarse particles, sediments and elements only up to their micron rating. Anything finer and most dissolved substances cannot be filtered out. As a result, water is far less clean and safe compare to reverse osmosis filtration. Q) Can I install this myself? What if I am unable to? Our systems come with detailed instructions and are easy to install. Most of our customers have successfully installed our systems themselves without any professional help. However, if you really can not or are just afraid to do the job, not a problem; just call on any plumber in the yellow pages and they can install it for you for a fee. If you happen to be located in Perth, call our main office to arrange a qualified installer - a small fee applies. ( this is for keeping the unit completely portable - if you wish to infuse the system in your current water supply you will need to call on a plumber). Q) What is the maintenance schedule and cost? Maintenance schedule and costings differ and are dependant upon certain conditions. The Membrane (Stage 4) needs replacing every 2-4 years again depending on usage. The costs differ on all filters, see our shop for pricing. Q) Is it easy to change filters? Very easy. Just order the needed filters from us and use the filter housing spanner that came with your system to swap out filters. This way you maintain the system yourself without depending on others and you will feel confident about your drinking water. Alternatively you can order the filters from us, and for a small fee one of our staff will come out and replace the purchased filters. As well we will upload a video to show you how to change your filters, and how easy it is. Q) Do I have to buy replacement filters only from Phat.? If you own the compact unit of ours, this is the unit that you replace filters from the top of the cannister, then YES, as these cartridges are a different size from normal reverse osmosis units. If you own the traditional type of filter, you can purchase from any supplier. Q) How can i tell what unit i have.? The easiest and simpliest way to tell what unit you have is by looking at the spanner that came with your unit. If you have the white or beige coloured spanner you have a traditional unit, if your spanner is black, you have our new compact unit. When you order your Stages 1 - 2 - 3 filters, make sure you correctly order either Traditional or Compact. Q) If I move, can I remove the system to bring with me? This system is very easy to uninstall. Even the plumbed in types are just as easy to uninstall as the units that are kept portable. There is no need to completely uninstall; just take off the main water inlet tubing, close our water inlet needle shut off, and take off the whole system in 5 minutes. Q) If I order your system today, when do you ship? We usually ship the next business day, or when payment has been cleared. Because we have all items in stock. Depending on your location, you'll receive the shipment in 2-5 days by AusPost. Faster service and international shipping are also available. All satchels go out via Auspost presently via Express Post, for the larger heavier items like a complete RO system, we use Auspost Raod, which can take up to 9 working days. Q) I've heard that Reverse Osmosis removes minerals from the water.? Partially true. If those minerals have impurities attached to them, then they will be removed, however there is quite alot of minerals untouched that pass through just fine. Q) I've heard drinking RO water long term is not good for you.? What a load of rubbish. How can drinking pure water be bad for you.? All staff and employees of Phatwater have been drinking RO water for 13 years now, and we are all in great health. We also hear from customers people say if they drink RO water they must have vitamins.?? Again what a load of croc. The vitamin and health industry is a billion dollar a year industry, it is within their interests to to get you buying vitamins. If you eat meat - fish - poultry - seafood - vegetables - fruit - nuts - yoghurt, then you body is getting more than enough minerals. If you feel you need minerals then buy them, but not because your using and drinking RO water. Q) I'm about to give birth will an RO unit and shower filter help.? Ok, now here is where it becomes personal choice. If you knew you're ingesting 30 chemicals not filtered by mains water, and that is being fed to your baby, would you do it.? Those are toxins, poisons, herbicides, pesticides etc. along with rust from pipes and sand and mud.? I know we wouldn't with our kids. Now think about when your bathing your new born.? Again those toxins etc..would you submerge your baby in poison.? Again the logical answer is NO. 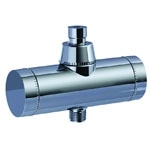 Should you use a shower filter fitted so you can fill your baby bath.? YES. Look at the never ending documentation on how filthy our water is. 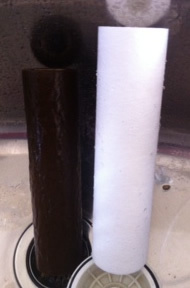 Then have a look at the filter below, this is after 4 months in a normal suburb in Perth. Would you ingest it.? Would you bath your kids in it.? Obviously the white filter is new, and the brown one on the left is only 4 months old, you choose would you drink it or bath in it. ?